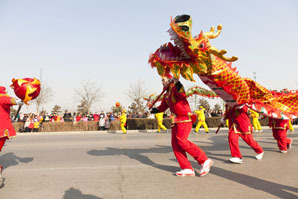 The dragon dance has been indispensable to Chinese festivals since ancient times. 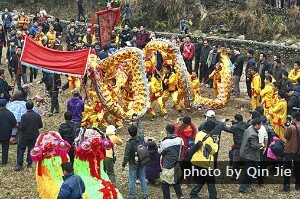 With the spread of Chinese people and culture all over the world, the dragon dance has been brought to every corner of the world where there are overseas Chinese gathered. It has become a symbol of Chinese culture. 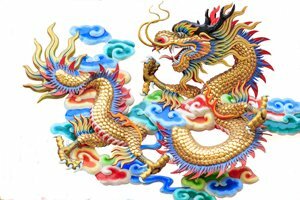 Dragon is a symbol of China, and is an important part of Chinese culture. 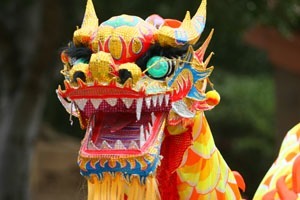 Chinese dragons symbolize wisdom, power and wealth, and they are believed to bring good luck to people. The origin of the dragon dance can be dated back to the Han Dynasty (206 BC–220 AD). It was then used in a ceremony for worshiping ancestors and praying for rain, and it gradually developed into an entertainment activity. 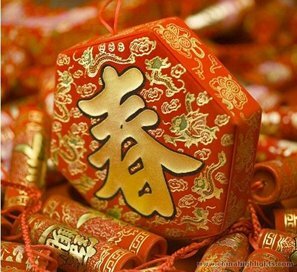 By the Tang Dynasty (618–907) and the Song Dynasty (960–1279), it had become a common ceremonial activity in festivals like Chinese New Year. The dragon dance costume used for a dragon dance is made of materials like grass, bamboo, paper, and cloth. Odd numbers of the dragon’s joints are regarded as auspicious, so people often make a 9-jointed dragon, an 11-jointed dragon, a 13-jointed dragon, or even a 29-jointed dragon. Dragons made of more than 15 joints are too heavy to dance, and are mainly used for display, so this kind of dragon puts more weight on decoration and boasts a high degree of both craft and technology. The dragon body is woven in a round shape of thin bamboo strips, segment-by-segment, and covered with a huge red cloth with dragon scales decorating it. The whole dragon is usually up to 30 meters in length — and people hold rods every 1 to 2 meters to raise the dragon segments. Another kind of dragon, called the &apos;Fire Dragon&apos;, is very eye catching at night, because candles or oil lamps are suspended inside it. Thin bamboo strips are woven into several cylinders, making up the body of the dragon, and covered with beautiful transparent cloth or paper — the skin of the dragon. At night it looks like a dragon full of fire. 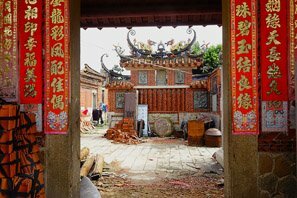 The dragon body used for the dragon dance is usually placed in a local &apos;Dragon King Temple&apos;, and only on the day of the dragon dance can it be taken out, accompanied by local people holding banners and flags, pounding on drums, and blowing trumpets. People connect the head and the tail of the dragon to its body, and hold a ceremony of "eye-pointing". 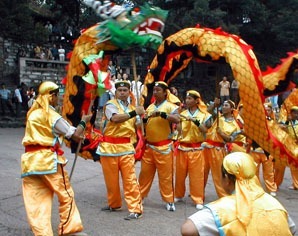 A person holding a rod with a big ball at the top leads the dragon during the dance. The ball is moved left and right, back and forth, up and down, and the dragon follows the ball. Its body, moving in waves, appears to be dancing. After the dance, the dragon&apos;s head and tail will be burnt, and the body is returned to the temple, where it will be kept for use the next year. The dragon is welcome everywhere it goes, and sometimes the team conducting the dragon dance can receive banquets up to five or six times, which are called "dragon exchanging wine". A dragon dance can usually be seen at the Spring Festival (Chinese New Year) and the Lantern Festival, but sometimes companies commission a dragon dance to bring good fortune to their business, especially if opening a new branch. You can see dragon dances in many Chinese cities and Chinatowns, but Hong Kong remains the dragon dance capital. 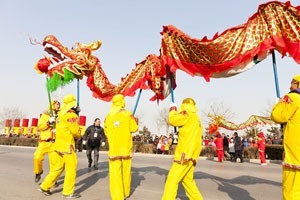 The HK Chinese New Year parade is an excellent opportunity to see dragon dances. The southern dragon dance originates from south of the Yangtze River. The body of the southern dragon is more finely decorated, and it’s heavier than a northern dragons&apos;. The southern style emphasizes momentum and strength, so it does not have agile movements, but has a grand appearance. Sizes: Usually 10 people are needed to carry a dancing 9-meter southern dragon. Since the southern dragon dance does not focus on flexible movements, the dragon can be made 20 meters long, 100 meters, or even 1,000 meters long (the record set in HK in 2012 was 5,605m!). The size of the dragon head is made according to its length. Production: The southern dragon is conventionally made of bamboo and paper, and the body’s skin is made of cloth with dragon scales drawn on it. 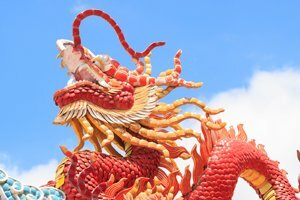 To save time, people sometimes design the decorative pattern of the dragon by computer, and machine-produce it. The common moves of a southern dragon dance are circling, making &apos;S&apos; shapes, and lifting the dragon’s head above the dragon’s body. This style was developed north of the Yangtze River. The body and head of a northern dragon are smaller than that of a southern dragon, and are made of paper or plant fibers, which make it considerably lighter. Northern dragon dances are often in a dark environment, so northern dragons are usually made with fluorescent materials. Its shape is designed to meet the needs of flexible dancing moves, such as rolling the head to the left and right. Different from the southern dragon, which focuses on strength, the north dragon emphasizes more on flexibility in its dancing moves. The northern style is more similar to lion dances. At present, the north dragon is more popular worldwide. Competitions and performances are frequently held in China, Hong Kong, Malaysia, and Singapore.